FX Real Estate and Entertainment Inc. revealed its development plans Monday in a 10-K filing with the Securities and Exchange Commission. 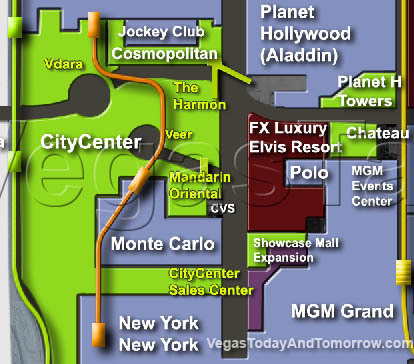 According to GlobeSt.com, the first phase of the $3.1-billion "Park Central" project includes a 2,269-room, luxury, Elvis-themed casino-hotel and a luxury branded five-star, 778-room boutique-hotel with 147 residential units. The tower will be topped with a rooftop restaurant, converting to a lounge after hours. The property will also include seven luxury villas overlooking the pool area. A future phase is to include a 1,000-room hotel. Klai Juba Architects and YWS Architects have been hired to work on the plans. Metro Flag has sold it's 17.72 acre strip-front property to FX Luxury Reality for $180 million dollars. FX Luxury wants to develop a (yet un-named) Elvis themed casino/hotel and condo project on the site. The property covers the land on the corner of Harmon Ave and LV Blvd (currently housing the Harley Davidson Cafe and the Travelodge) including the Hawaiian Marketplace in front of Polo Towers and the land to the south of Polo Towers where a small plaza now sits. There are height restrictions on the Hawaiian Marketplace parcel. FX is partly owned by New York Entertainment group CKX. CKX owns licensing rights to Elvis, Muhammad Ali and American Idol. So, those themes could pop up soon as well. All this while MGM is shaking the themes out of its hotels, go figure.